The co-facilitators of the preparatory process, H.E. Mr. Álvaro Mendonça e Moura, Permanent Representative of Portugal and H.E. Mr. Burhan Gafoor, Permanent Representative of Singapore to the United Nations convened an informal briefing on Wednesday, 1 February 2017 for Member States and stakeholders on the preparations for the preparatory meeting for the United Nations Conference to Support the Implementation of Sustainable Development Goal 14. 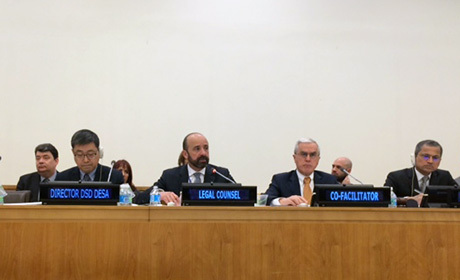 Mr. Miguel de Serpa Soares, Under-Secretary-General for Legal Affairs, the Legal Counsel and Special Adviser to the Co-Presidents of the Conference on Oceans, and Mr. Juwang Zhu, Director of Division for Sustainable Development of UN-DESA on behalf of the Secretary-General of the Conference, presented the Secretary-General’s background note for the preparatory meeting, which contains a proposal for themes of the partnership dialogues.